It’s Fall, y’all. And you know what that means – pumpkin spice everything. We have seen everything from Pumpkin spice tortilla chips to pumpkin spice Oreos and everything in between. Is there a point where it becomes too much? Probably, but we haven’t found that point yet! In that spirit, this month’s recipe comes to us from the food blog Cookie and Kate. We hope you enjoy these Healthy Pumpkin Muffins as much as we have! Kate does a fantastic job of providing plenty of substitutions and add-ins for these muffins (we heard you, vegans!) and it’s a great way to get some whole grains into your morning (or, if you’re like us, with that afternoon coffee refill). Enjoy! Easy, one bowl, maple-sweetened, pumpkin muffins made with whole wheat flour, oats, coconut oil and spices! 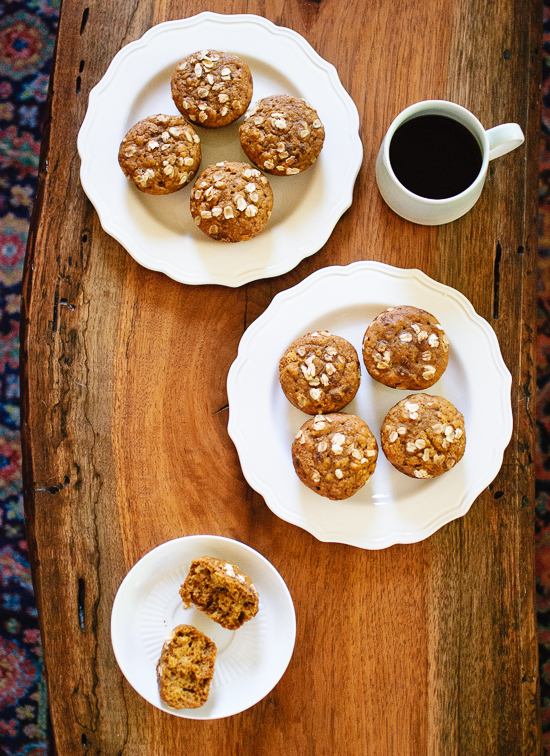 These healthy muffins are as light, fluffy and delicious as their coffee shop counterparts. Tip: measure your pumpkin purée by packing it into a dry measuring cup and leveling the top, instead of using a liquid measuring cup. Recipe adapted from my honey-sweetened pumpkin bread. MAKE IT EGG FREE: Readers report that these muffins turn out well with flax eggs! MAKE IT VEGAN: Use maple syrup, flax eggs and non-dairy milk. MAKE IT DAIRY FREE: Simply use your non-dairy milk of choice. CHANGE IT UP: You could really go crazy with add-ins here! Fold in mini dark chocolate chips, chopped dried cranberries or crystallized ginger and/or chopped nuts like pecans or walnuts. Liz topped these muffins with my maple glaze from my pumpkin scones recipe, which sounds like a delicious idea to me! SERVING SUGGESTIONS: These muffins would be fantastic with homemade pecan butteror coconut butter.